- there's a piece of it for everyone to enjoy! A season filled with so many cherished moments it's hard not to get excited about it! Maybe you or a family member are doing some renos to the lake house or cottage. You love the vibe your summer haven gives off, but the decor needs to be revamped. We have something that will give all your guests those good summer feels. The Coastal Life Collection is filled with welcoming wall art... because let’s be honest, no one wants their welcome to be stomped on by visitors. Sorry welcome mats - you’re a thing of the past! Perhaps a blissful matrimony is marked in your calendar for that couple that has been waiting for the summer season to share their love. You want to give them a gift... something personalized, not just some mulla in an envelope. Our Wedding Collection is the perfect place to get those newlyweds a memorable keepsake they can adorn their wall with that makes them reminisce about their special day. What about a quote that inspires you? With our Words Of Wisdom collection, you can choose words that speak to you and have your name incorporated into the print for that extra dose of mental attachment. It’s the ultimate way for you to express yourself and continue to fill your home with FEEL-GOOD wall art for an inspired living. Whatever the occasion, our LookBook is filled with wall art that makes you feel good. Nothing beats that personalized touch! Ok… it’s time for a peek. Enjoy!! Coastal Life Collection Life can sometimes be a beach, but life AT the beach, well that can’t be beat! Having a piece of welcoming wall art at your front door, that gets your guests excited about some glorious time in the sun, makes your place a mandatory stop! But, what about those first timers that have never been to your place? Use one of our pieces in front of your abode to make sure everyone knows exactly where to go. 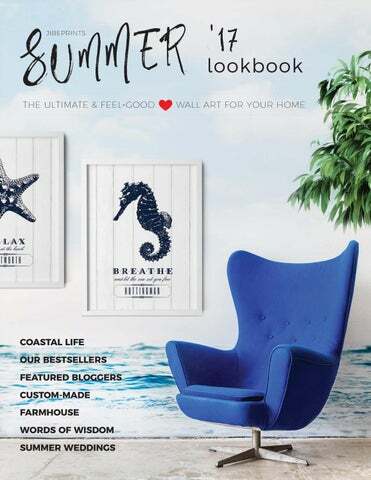 What if you are simply sprucing up your cottage… or adding some nautical flair to your home? We have pieces that will give your place that aquatic feel. Life is better at the cottage, it’s not just wall art, it’s a happy state of mind - no matter where you are! Our Bestsellers Our wall art has made an appearance in home decor of many inspiring lifestyle bloggers. Their calming, neutral, boho style is the perfect environment for our feel-good prints to nestle into. These very talented new friends of ours have demonstrated how these bestselling prints can be placed in any room around the house AND that they make the perfect focal point for gallery walls! Maybe a rustic, farmhouse style is more your thing - we have a farmhouse piece that will knock your socks off. Whatever your taste, each piece can be personalized with your familyâ&#x20AC;&#x2122;s nameâ&#x20AC;Ś you can even add the fur babies! SOMETIMES YOU HAVE TO TRY A FEW SPOTS BEFORE YOU FIND THE PERFECT ONE! GALLERY WALL IT IS! WHAT ARE YOUR FAMILY VALUES? WE ALL NEED A LITTLE REMINDER OF WHAT'S IMPORTANT SOMETIMES. THE FAMILY MANIFESTO IS THE KIND OF WALL ART, THAT MAKES A STATEMENT IN ANY ROOM IN YOUR HOME AND BLENDS SEAMLESSLY WITH ALL TYPES OF DÃ&#x2030;COR. BELOW, THIS PERSONALIZED PRINT HAS BEEN BEAUTIFULLY DISPLAYED BY A VERY CREATIVE AND TALENTED LIFESTYLE BLOGGER! CUSTOM PRINTS ARE A GREAT SOLUTION FOR THOSE WHO ARE LOOKING FOR SOMETHING SPECIFIC, BUT CAN'T FIND IT ANYWHERE. 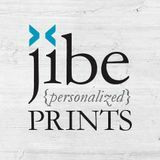 WHETHER IT’S A FAVORITE BOOK QUOTE, SAYING OR A MANTRA, EMAIL US AND LET’S CHAT ABOUT A PERFECT PRINT FOR YOU! VISIT ALMAFIED.COM TO SEE HOW YOU CAN MAKE THIS FRAME IN ONE HOUR! TWO COMPLETELY DIFFERENT DISPLAYS... BOTH EQUALLY STUNNING! Words Of Wisdom Collection We all need a little inspiration from time to time. Be it in a home office, a guest room, a work out corner. Reminding yourself to keep pushing, keep growing, is needed. What if you have a big meeting coming up? Glancing at a piece of wall art conďŹ rming you are AWESOME gives you that extra pep in your step! Seeing these affirmations daily, plants seeds of positivity and our subconscious makes that positivity blossom! Weddings Collection More memorable than a…. toaster! These gorgeous custom prints aren’t just good as gifts, they are perfect for wedding decor to welcome guests to the ceremony or reception. Not only pretty but also functional - we have matching unplugged ceremony prints! We know how important it is to have your guests present while you are sharing your special moments with them and not have them watch your ceremony through the screen on their phone. But wait… there’s more! All brides and grooms-to-be know the pain of coordinating who sits with whom at what table. To display the sometimes many hours of work that goes into seating arrangements, we have for you… custom seating charts! OUR PERSONALIZED WEDDING PRINTS WILL COMPLIMENT YOUR WEDDING COLORS. USE THEM INDOORS AND OUTDOORS AND MAKE THEM A PART OF YOUR PHOTOSHOOT! OUR UNPLUGGED CEREMONY PRINTS WILL MATCH YOUR FAVORITE STYLE AND ARE AVAILABLE AS A PRINT OR AN INSTANT DIGITAL DOWNLOAD! YOUR ENTIRE FIRST ORDER WHEN YOU SIGN UP TO OUR MAILING LIST! JUST LOVE THIS PRINT, WILL LOOK PERFECT ON OUR LARGE WALL IN THE MIDDLE OF THE GALLERY COLLECTION I AM CREATING. THANK YOU FOR VERY FAST SERVICE AND SHIPPING! WILL DEFINITELY BE ORDERING AGAIN. THANK YOU SO MUCH THIS IS EVEN MORE BEAUTIFUL IN PERSON. I CANNOT WAIT TO FRAME IT AND PLACE IT IN OUR NEW HOME! The Ultimate & FEEL-GOOD Wall Art For Your Home!